You may be wondering why a gecko would be used as a symbol for ecologically friendly products. We are dedicated to developing and producing disposable cutlery and tableware that are convenient for use in our modern world, but that are made from RENEWABLE resources. Due to the gecko’s ability to cast off and regenerate its tail, it has long been a symbol of RENEWABILITY among certain native tribes in North America. All of our products are made from resources that are harvested in a SUSTAINABLE way. This means that they can be re-grown and re-harvested over and over again. It takes about three weeks for geckos to completely regenerate a new tail. They can shed their tails over and over again, thus making it a SUSTAINABLE practice. The overuse of natural resources that are not biodegradable has created a generation that is interested in REDUCING their “CARBON FOOTPRINT”. 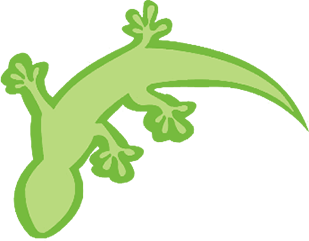 Since this is also our goal, Eco-gecko products are made using better techniques and are 100% biodegradable. Geckos have specialized toe pads that employ molecular science, enabling the gecko to climb smooth vertical surfaces. They’re not just a set of sticky feet, as once assumed. Thus, through better techniques, they LEAVE NO sticky FOOTPRINTS behind. Many have thought that environmentally responsible products must be unattractive. It is our goal to make sure our products are even more ATTRACTIVE than the others. Let’s face it, geckos are cute and lovable. Even if you don’t like lizards, you have to admit that geckos are the most ATTRACTIVE reptiles out there.